The Grossly Exaggerated Death of the Library, or Why I Don’t Discourage Students from Attending Library School. What do you say to the next generation of Librarians? Since I’m a First-Year Academic Librarian Experience I would assume the “next generation” is probably me, and it is a little too soon to play the grizzled older “in my day” type librarian. Because I work in a University Library, I know students finishing their undergraduate degrees considering graduate school or library school. They ask me if library school is a good idea and what a person like them should do if they’re interested in the humanities. I suspect that because I’m so close to having finished school I am sensitive to those questions. After my own negative experiences in undergraduate and graduate school, I have decided that I will not discourage anyone from the path that I succeeded on. I ask those who tell students not to pursue librarianship where else these students should focus their energies? Libraries have a real crisis of confidence. 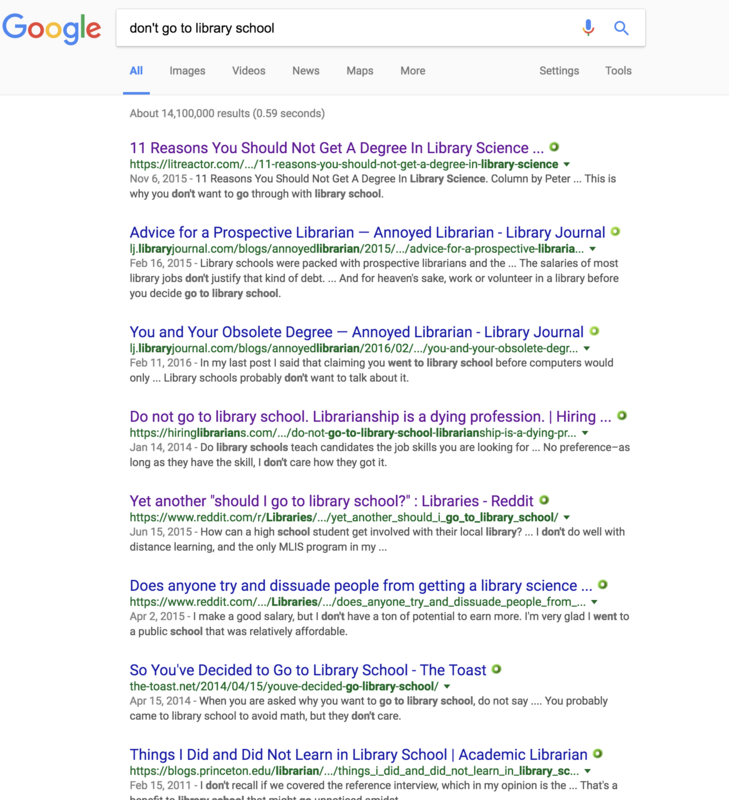 Google “don’t go to library school” (I took a screen shot so you don’t actually have to google it) and you’ll see the kind of pessimism that plagues our students. 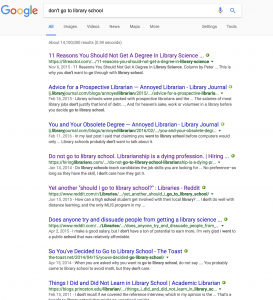 The result of this is that students have a clear and unhealthy obsession (see any /r/Librarians Reddit posts), in some ways encouraged by current librarians, about whether or not they’ll get a job at the end of school. It doesn’t help that resources like Hiring Librarians, while a great source of information, often publishes the most pessimistic and disheartening interviews with “hiring” managers. Librarianship is dying, everyone abandon ship. As a student, I wrote extensively about this phenomena and how it breeds insecurity and negativity in already stressful student lives. Now that I’m a professional I see that this insecurity and negativity then leads to an undervaluing of the work that we do on college campuses. Many of us had formative experiences working closely with librarians in University Libraries and wanted to “pay it forward” by being part of the library-industrial-complex. When we tell students not to pursue what we have succeeded at we tell them that they are not as good, elite, or lucky as we are. Judging from my friends and colleagues, I know that these concerns are not limited to librarianship. Anxiety over jobs and the economy is one of many issues that drove voters to the polls seeking “change” a month ago. Many of you will say “but librarianship is special because it is really dying!” Much of this is predicated on a longstanding prophecy of the death of print and of the book itself (after all what is a library if not a place for books). Whether or not this death comes from technology or from a deep-seated American anti-intellectualism, the threat to learning and reading impacts directly on our profession. Ongoing austerity movements in government challenge librarians to justify their own existence. But our “worth” is transcendent as J. Stephen Town writes “relying on a shared belief that there is an impact through higher education on individuals and society, and beyond that there is a value arising from being educated, which relates in a fundamental way to human flourishing.”(112) While “human flourishing” is difficult to measure it is unlikely our society will totally move past an expectation of education and learning as a hallmark of growth. But if we cannot measure the impact of the library, how do we know that it isn’t dying? In anticipation of the death of libraries, there are two paths that librarians and scholars have taken. One has been toward change and innovation (or as a pessimist might say bargaining) where we change what we do and how we measure it to prove our worth and the other toward resignation and defeatism, where we tell people the library is dead and not to join our funeral parade. There is a great article that counters this pessimism entitled “The Library is Dead, Long Live the Library!” where the authors acknowledge that the academic library faces competition in the digital world as we are no longer the chief source of information for students and the public while positing the changes we need to make to ensure our own survival. (Ross 146) The “information fog,” as William Badke calls, makes us all lost and librarians are those who can leads us through the murk. Interestingly, the rise of the anti-intellectual is often attributed as either the result or the cause of the libraries downfall. The ongoing and well publicized struggles with “fake news” are seen as either calls to arms for librarians or defeated examples of the long decline of the library in American life. Either way, the importance of librarians is still central to the teaching of information efficacy and theory, and, if the present crises in media confidence shows, we will always be needed. The library is not dying, it is changing. This is not outside of our own history nor is it something about which we should be afraid. Students should be aware of that change and the challenges of the future but never discouraged by it. If we believe that the current and future work is worth doing then we should encourage those likeminded students to continue our cause. I do not want to downplay the struggles of unemployed or underemployed librarians, and I don’t ascribe to the ongoing and troublesome myth that librarians will be retiring and we’ll all get nice paychecks when that happens. I also do not want to paint a rosier picture than exists for new graduates. There are real struggles for people wanting to get into librarianship, but we should never discourage those that are interested in our work from getting involved. If every Library student listened to their faculty mentors about not applying to graduate school we’d have no graduate students next year, and no new librarians in two years, and our universities would collapse along with society. This is an exaggeration, but if I was discouraged from reading about how librarianship was dying, I wouldn’t have the job that I enjoy so much. I expect that many of you had that same discussion and warning prior to enrolling in school. Losing people like us is the danger in telling students not to pursue the work that we love. Badke, William. Research strategies. iUniverse: New York, 2004. Town, J. Stephen. “Value, Impact, and the Transcendent Library: Progress and Pressures in Performance Measurement and Evaluation.” The Library Quarterly: Information, Community, Policy 81, no. 1 (2011): 111-25. doi:10.1086/657445. Ross, Lyman, and Pongracz Sennyey. “The library is dead, long live the library! The practice of academic librarianship and the digital revolution.” The Journal of Academic Librarianship 34, no. 2 (2008): 145-152. Author Dylan BurnsPosted on December 14, 2016 Categories First Year Academic Librarian Experience, Graduate Students, Idiocy, Information Literacy, library careers, LIS EducationTags future, library school, students2 Comments on The Grossly Exaggerated Death of the Library, or Why I Don’t Discourage Students from Attending Library School. Please welcome our new First Year Academic Librarian Experience blogger Rebecca Halpern, Reference and Instruction Librarian at Antioch University Los Angeles. I very recently began my position as a reference and instruction librarian (though all opinions herein are entirely my own). Our library is teeny-tiny and I’m part of only a two-person librarian team. The position brings a lot of challenges and opportunities which I’m looking forward to sharing here, but lately I’ve struggled with something unique to being a first year librarian, something no one had really prepared me for, something that should have been obvious: not being a student any longer. Like a lot of my colleagues, I really enjoyed school. I loathed snow days, felt cheated when my teachers showed movies, and always finished my homework early. Is nerd the right word to describe me? I think I prefer academically-minded. I went straight to the University of Michigan after high school and took only a year off between undergrad and enrolling in my MSIS program at the University of Texas. For the past 25 years, I’ve identified as a student and had come to really appreciate the lifestyle studenthood brought. Like many of my classmates, I worked, had internships, presented at conferences, and took a full class load. My weekends were hardly restful; indeed, I used weekends to catch up on projects and pick up work hours. I often went weeks at a time without having a “day off.” Crazy as it may seem in hindsight, I liked being extraordinarily busy, filling my free time with homework and volunteering and internships. Though I’m sure my boyfriend and family appreciate that I now have a regular 5-day schedule, I’m finding it difficult to feel fulfilled with my weekends. Two-plus decades of being a full-time student kind of interfered with my development of non-academic hobbies. I find myself pacing around my apartment at times, not sure what to do with myself. Sure, I like to read and exercise with my dog and spend time with loved ones, but no longer living my life at a breakneck pace feels kind of…dull. I’m still looking for ways to fill my time that feel as satisfying as finishing off a collaborative school project. Transitioning out of student life has meant, for me, that I get to explore new interests and develop new skills. But in the meantime, that transition has been slow, frustrating–and dare I say–scary. It seems kind of silly to complain about free time, doesn’t it? When I thought about joining the FYALE blogging team, I was excited to start writing for a blog again. And the first year of any job, let alone an academic librarian job, is sure to bring a certain amount of adventure. Blogging creates communities and professional communities are very important to me. But for this first post, I wanted to go off-the-beaten track just a bit and remind myself (and all of you) that we have lives outside of our professional roles–and indeed, part of being a first year librarian is finessing how to balance our professional selves with the rest of us. We all had to balance the professional and the personal in grad school to be sure, but at least for me, I found those two worlds to be blissfully intertwined. Now that I have non-librarian friends who want to do non-library school activities, that balance is a bit harder to achieve. What has been the biggest surprise for you since leaving grad school and joining the professional world? How have you handled your own transition? Share your story with me in comments or on Twitter, @beccakatharine.